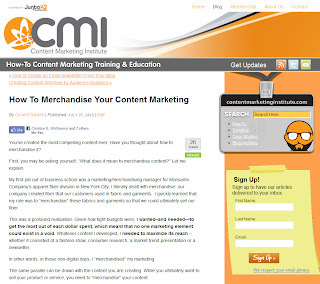 My latest post on Content Marketing Institute has been published. 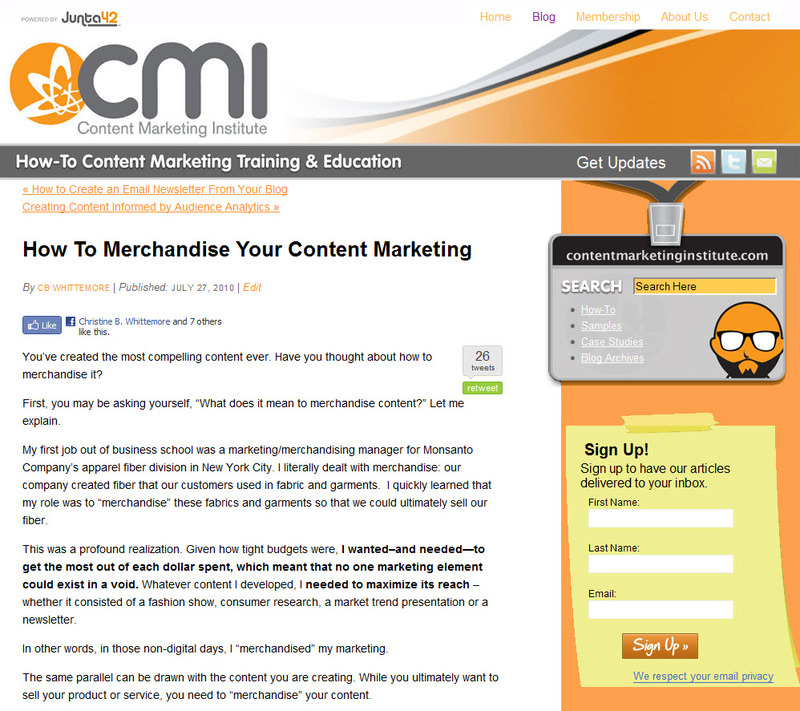 It's titled "How To Merchandise Your Content Marketing". Not sure what I'm referring to when I say merchandising? From Wikipedia, "Merchandising is the methods, practices, and operations used to promote and sustain certain categories of commercial activity. In the broadest sense, merchandising is any practice which contributes to the sale of products to a [retail] consumer." Pretty relevant to what we do on an ongoing basis, wouldn't you say? I bet you, too, 'merchandise' your marketing. Read the post and let me know. Would you share some of your examples? P.S. : I would be remiss if I didn't tip my hat to Gary Petersen, who hired me out of Columbia Business School into my 'merchandising' role and has since become not just a wonderful colleague, but also a friend. TalkFloor's Dave Foster and I continue to explore social media marketing. From Advanced Twitter, we have moved on to LinkedIn. Before I go further, are you on LinkedIn? How do you use LinkedIn? What do you like most and least? I'd love to hear. Of all of the social networks, I've been on LinkedIn the longest having joined shortly after it was launched. However, it's also the network that has taken the longest to evolve beyond a resume posting site into an actual social network with interesting and useful interactive resources. 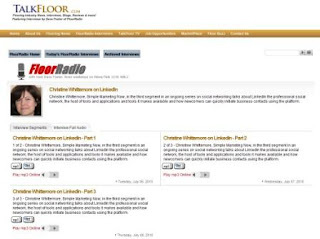 Dave and I explore some of those features in the following TalkFloor interview about LinkedIn which you can access by clicking on this link. Christine Whittemore, Simple Marketing Now, in the third segment in an ongoing series on social networking talks about LinkedIn the professional social network, the host of tools and applications and tools it makes available and how newcomers can quickly initiate business contacts using the platform. Here are shownotes and details relating to our discussion about LinkedIn. It's a professional social network, launched in 2003, which now claims 70 million members in 200 countries in all 7 continents. Visitors to the site have jumped 31% from last year to 17.6 million in February 2010. Every Fortune 500 company is represented and 81% of business-to-business marketers use LinkedIn. Here's what I find particularly valuable: new networking functionality has been recently added - particularly as it relates to groups [for more information read: Welcome to a whole new way of experiencing LinkedIn Groups]. Pretty exciting! LinkedIn used to be quite static – primarily a place for resumes. Although it is considerably more interactive, LinkedIn is a much calmer, corporate like environment compared to Twitter or Facebook. It's a wonderful environment for keeping track of people you know and connecting with people you meet professionally. It's valuable for networking, researching and connecting for business purposes. What's important to remember is that search engines such as Google like LinkedIn profiles. If you have a LinkedIn profile and Google yourself, you'll notice that your profile appears prominently on page one of search results, making it an important element of your personal and professional brand reputation management. Manage your profile and control what people find about you and your company. Within LinkedIn you can search people, companies and groups. You can see how you are connected to others; you can learn more about the person you’ll be having a business meeting with and have a more productive session. You can also send personal messages. Definitely, your personal profile. Set it up; complete it 100%. Add a photo, import your contacts and browse through your connections’ connections to find others you know. LinkedIn will also suggest people for you to connect with. NOTE: when you invite others to connect with you, be sure to customize the invitation so it sounds like it came from you. This makes a difference! Once you have your profile created, be sure to claim your vanity LinkedIn URL [e.g., mine is CBWhittemore]. To do so, go to settings/public profile; you'll see the prompt to customize your LinkedIn profile URL. Be sure to note the other options available. I recommend that you look into several neat features that LinkedIn offers for enhancing your personal profile: You can add a feed from your blog. Embed your Slideshare presentations. Add link to files like resumes and marketing kits [via Box.net]. Definitely complete your profile. 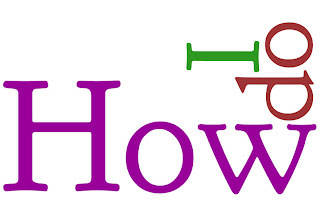 Include in your profile links to your website, blog, etc. Be sure to use relevant keywords in your headline, your current experience, your summary, your specialties... Don't forget to issue status updates on a regular basis. Note: your LinkedIn updates can be connected to your Twitter account. Consider creating events in LinkedIn to raise awareness for what you are doing. Definitely, recommend others and request recommendations [again, be sure to customize your request message]. Explore the other valuable LinkedIn features. Do a search and see what comes up [Note: simply select groups in the LinkedIn search window; it defaults to people]. As it relates to Flooring, you'll notice 109 currently. Most popular ones appear first. Check them out. Consider creating your own about a subject you are passionate about. NOTE: It's critically important to moderate and be actively involved in your group to ensure quality of content and high level interaction [i.e., no spam]. I give the example of HIMSS' best practices : moderate, post guidelines, educate about policies, ask questions, followup, interact, keep it fresh and relevant. I recommend that you integrate LinkedIn into your other activities online and offline. For example, on your website, add link to your LinkedIn profile on your about us page. When you meet new people, connect with them on LinkedIn. Add a link to your LinkedIn profile in your email signature. Include a reference to it on your business card. Demonstrate thought leadership by participating in LinkedIn Answers: ask questions/provide answers – Caution: don’t shamelessly self-promote! Find relevant groups to contribute insights to. You can also use LinkedIn’s DirectAds to push relevant ads to LinkedIn subscribers targeted by profile demographic info. For more information, check out LinkedIn’s Learning Center [click on More in your LinkedIn navigation menu], the LinkedIn Blog, MarketingProfs has put together a case study collection, and see the resources below. Explore groups and join one. What LinkedIn questions do you have? How do you make LinkedIn work for you? Next: Getting practical with LinkedIn. It's not just simplicity v. complexity, but also self-inflicted complexity http://bit.ly/cb3Zgt Awesome #practicalmktr! 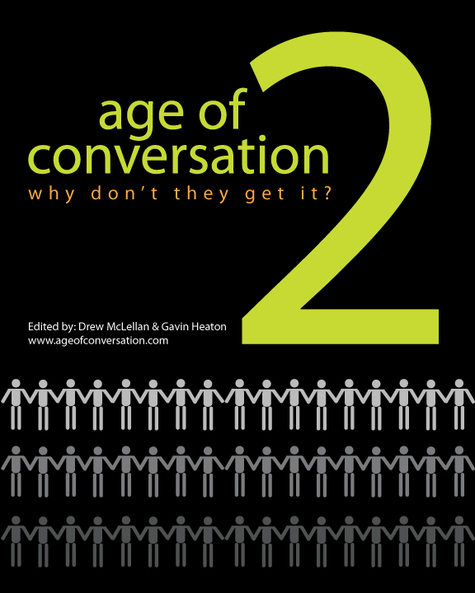 Jay Ehret has published on Power to the Small Business! his latest podcast featuring Marketer's Roundtable 6 during which Jay Miletsky, Rich Becker and I sat around a virtual roundtable and discussed current marketing issues with Jay Ehret, our host. We each brought to the table our very own hot marketing topic or issue. We each had the opportunity to voice opinions and ideas on one another's topics. Jay Ehret kept us on track as he added his own perspectives! 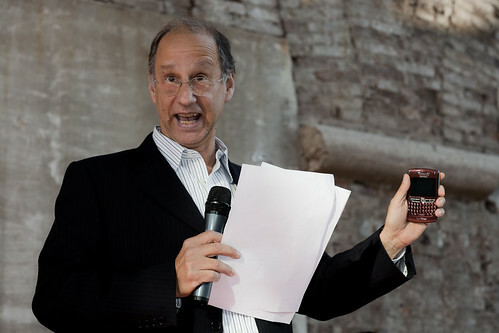 Jay Miletsky, CEO of Mango! Creative Juice, started us out with the first topic: On Marketers and Social Media Reality. Rich Becker, President of Copywrite, Ink, went next and introduced On Managing and Measuring the Marketing Mix. C.B. 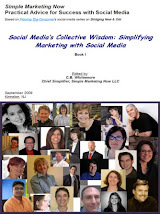 Whittemore, Chief Simplifier of Simple Marketing Now, [that's me :-)] introduced On Blending Online and Offline Marketing. Please do listen to the podcast. 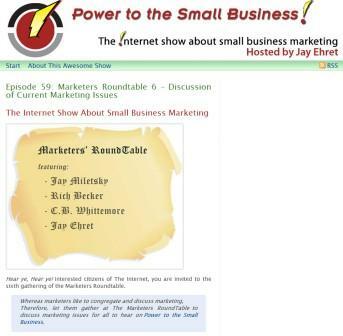 It lasts 34 minutes and is available by clicking on this link to Marketers Roundtable 6 - Current Marketing Issues. 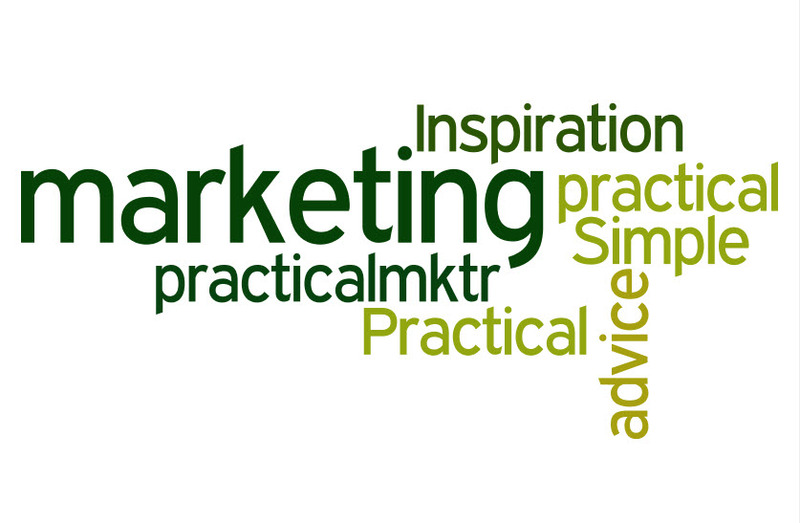 The link also includes show notes and selected quotes organized by marketing topic. If you'd like to download an MP3 copy of the podcast [for personal use only], you can do so by clicking on this link to Power to the Small Business #59. Thanks, Jay, for the opportunity. Thanks, Jay, Rich and Jay, for a thought-provoking marketing discussion. Special thanks to Rich for his nice 'simplifier' comments! I'd love to hear what you think - including what topics you suggest that Jay address in his next Marketers' Roundtable Discussion! The recently completed series of interviews done with TalkFloor's Dave Foster about Twitter belongs in the How Do I? 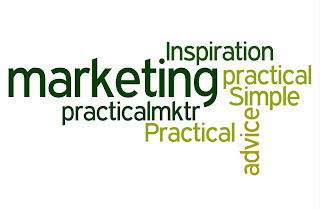 social media marketing series. After all, all three parts go into great detail about Twitter itself, how to make sense of it, how to use the tools, and how to apply Twitter for use in business. Here, then, are links to the three parts. Part I: #TalkFloor Series on Social Media addresses What is Twitter and Why Should I Care? Part II: #TalkFloor Series: Twitter & Social Media explains How To Get Started With Twitter. Part III: #TalkFloor Series: Advanced Twitter discusses how to become a Twitter power-user. Included in each section you'll find recorded interviews and detailed notes with links.